In the final exhibition of our 2017 Digital Gene Pool online exhibition series, we invited the subversive talent PILproject (Post-Internet Landscapes) to work within the actual content of our website. 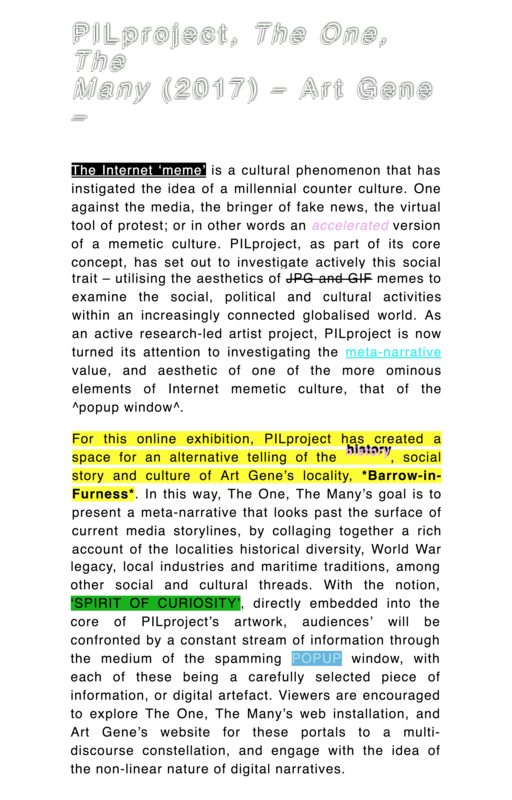 For the duration of their exhibition, The One – The Many, PILproject have embedded portals across our website: and by exploiting the aesthetics of the familiarly ominous medium – the pop up window, telling a rich account of the historical diversity, World War legacy, local industries and maritime traditions of our home town Barrow-in-Furness. The page gives static information about the PILprojects digital exhibition with us. Explore Art Gene’s website for portals to The One, The Many digital installation (November 21 – February 1st, 2018), (depending on your system and system preferences, you may need to deactivate your Popup Blocker to experience the artwork as intended). Alejandro Ball is a Peruvian/American new media artist, curator, and fabricator practicing between London and Dundee. His work and interests lie in the exploration of language as social coding and its integration into human culture and consciousness through new media practices and sonic elements. He has collaborated with various institutions including: Visual Research Centre, DCA, in Dundee, me Collectors Room in Berlin, the Whitechapel Gallery in and Five Years Gallery in London. Juan Crespo works and lives in London. He graduated in Fine Arts from the University of Barcelona, where he also completed his MA, Artistic Production and Research. Crespo’s work is informed by local myths, folk heritage and a de-colonial approach to history, which is formalised through a variation of archival gestures, installations or new media projects. He has exhibited with various institutions including: Foco, in Lisbon, Chalton Gallery and Window Space, London, Galeria Senda, Barcelona and La Panera, in Lleida.